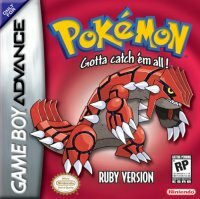 Pokemon Ruby and Sapphire, often dubbed Pokemon Advance during their prerelease, were released in 2002. 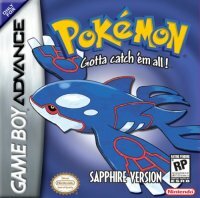 The next generation of Pokemon, right after the initial mania surrounding the series had subsided, ignited the sales of the Game Boy Advance and brought a major facelift to the game both graphically and mechanically. Although in comparison to GSC the improvements seems minor and abandoned features major, they were for the most part essential to perfecting the formula of the games and mostly behind the scenes - but still extremely important. One of the first things people noticed was the inability to trade over Pokemon from the first or second generation. At the time this was both technologically unfeasible and necessary to revamp the way stats are structured, with that method being used up to Generation VI today. For that reason it is completely possible to have your first team from 2002 on your X and Y cartridge in the present day. The second biggest change was the removal of day and night in favour of a much more simplifed clock system that wasn't nearly as in depth as that of GSC. Little is known about why that was removed but perhaps it was for graphical reasons on the GBA or to maintain consistency with FireRed and LeafGreen, which would be released not too long after. The games did introduce a number of things in their own right, some of which cannot be used now and some of which have become staples. In no particular order, there is now the Pokemon Contest and the corresponding stats, the e-Reader cards, Pokemon abilities, natures, EV-based stat calculation, double battles, external weather conditions, and a more in-depth plot that differs slightly between versions. Other features like shiny Pokemon, breeding, in-game events, and the Battle Tower have been retained. Ruby and Sapphire starts in another new region, Hoenn, which is an island farther away from the joined Kanto/Johto area. Although there are several old Pokemon in the region for catching, they are limited to just 67 entries in the Hoenn Pokedex - the remaining 135 are brand new and the real focus of the games. If you want to use old Pokemon, you will have to trade them over from later games of the generation. This is not the case for Emerald, which we will get into later. If you decide to keep with what's available, you'll get a good chance to try out the new Pokemon while still seeing the occasional familiar face. Enjoy!